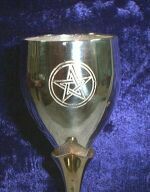 A goblet or cup usually holding wine, which is shared around the circle in Wiccan and many neopagan rituals and celebrations. 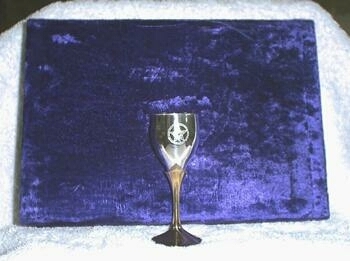 The Chalice represents both the Female and a Water symbol and can be used for scrying or crystal gazing, or for holding a libation to the god/dess/es. Our Travellers Chalice is small and compact, easy to carry on trips away. Perfect for the home or travelling altar, this cute little chalice features a Gold plated Tulip style stem. 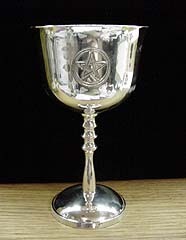 The Gold stem supports a Silver plated cup with etched Pentagrams - a unique contrast of Gold and Silver. 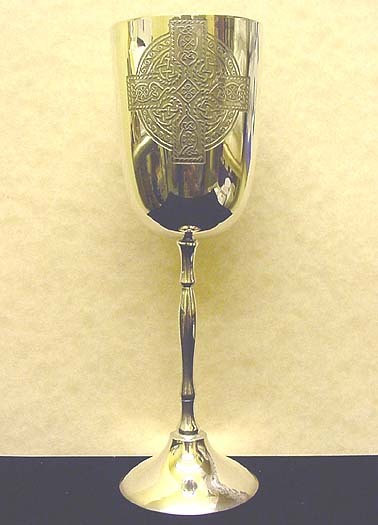 A shorter Silver plated Altar Chalice with a fancy stem and a slightly curved lip on the rim (8cm dia). Features an etched Pentagram in Circle - back and front. The Silver base is a dome shape. A taller Silver Plated Chalice featuring an etched Circular Celtic Cross symbol - on the front. The cup is 6.5cm dia and the base is slightly curved, very elegant.